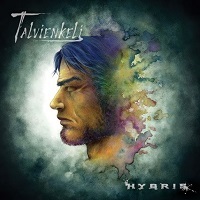 TALVIENKELI is a Progressive, Symphonic Metal band from Lyon France, and “Hybris” is their debut album to give us Metal heads around the world yet another reason to love female fronted bands with a strong musical ensemble and evocative lyrics, with the only difference of the progressive Metal element being added up instead of the more gothic approach. Theatrical and profound, the tone of TALVIENKELI, bonds violence with beauty like only acts like EPICA, AFTER FOREVER or NIGHTWISH have done before, put together into a single work of outstanding production with extraordinary time changes and pacing, different to anything I have experienced before, operatic style female vocals bonded to a Progressive Metal execution with a delicate, elegant and graceful style, with certain tones of darkness inserted in the exact place. Rhythmic and fast paced “Immortal” creates a vast multiverse into which all notes emerging from the guitar of “Pierre Besançon” create a powerful in crescendo up to the time when The voice of Camille Borrely in addition with the powerful onslaught created by this musical ensemble can touch the most profound fibers of virtue along with the force and brawn that develops collectively specially after the angelic like interlude that takes advantage of the lead vocalists tessiture once more up to the end of the song. “Atlas” is an intricate and enigmatic song, depicting to me the best elements of the band, no wonder it has been chosen as one of the songs to allow the band to be introduced to neophytes, and the way it links with “Raining Moon” a piece of musical prowess that engulfs the combination of the voice and the piano entwined in an ethereal essence that introduces you to “Deadly Nightshade” to bring this unintentional trilogy to an end, represents what happens when the talent of both the band and the producer can get the different ends to meet.